White paper on crime 2001 Part 1/Chap.1/Sec.1/3. In this section, we will examine the trends of penal code offenses that usually attract attention from the public. Table I-2 shows the trends in the number of cleared cases of homicide for insurance money since 1992 for which statistical data are available. There has been an upward trend since 1998. According to the Criminal Investigation Bureau of the National Police Agency, there were 15 reported cases of robbery with the use of handguns, rifles, etc. in 2000, compared to 9 in the previous year, of which 8 cases targeted cars used for transporting cash or financial institutions. Table I-3 shows the trends in the numbers of reported cases, cleared cases and clearance rate for robbery targeting cash transit vehicles over the last decade while Table I-4 shows the trends in those numbers for robbery targeting financial institutions over the last decade. In recent years, the number of reported cases of robbery has been increasing (see Part IV), of which the numbers of reported cases for on-the-street robbery and for so-called convenience store robbery targeting overnight supermarkets including 24-hour convenience stores have been increasing rapidly. Table I-5 shows the trends in the number of reported cases, the number of cleared cases and clearance rate for on-the-street robbery and for robbery targeting overnight supermarkets over the last decade respectively. The numbers of cases have shown significant increases since 1996 for on-the-street robbery and since 1998 for robbery targeting overnight supermarkets. Table I-6 shows the numbers of cleared cases and persons cleared for penal code offenses based on child abuse in 2000, compared with those in the previous year. Childe abuse refers to acts such as physical abuse, sexual abuse, mental abuse, neglect or rejection by a guardian (a parent exercising parental power, a guardian for a minor or another person who actually takes the custody of a child) towards the child (under 18 years old) under the custody of the guardian. Except for desertion by a person responsible for protection of the victim and gross negligence resulting in bodily injury or death, the numbers of cleared cases and persons cleared showed significant increases with respect to all types of offenses for child abuse. Table I-7 shows the relationship between victim and perpetrator in the above cases cleared for penal code offenses in 2000. About two-thirds of the cleared cases of homicide were committed by biological mothers while the cleared cases of bodily injury were most frequently committed by common-law husbands of the biological mothers. The Law Concerning the Prevention of Child Abuse (Law No.82 of 2000) was promulgated on May 24, 2000 and came into force in November 2000. Though not having the special provisions for sanctions, the Law strengthens the authority of child guidance centers to enter and examine families on the spot, considering child abuse a problem of the whole society rather than a problem of individual families, as it had been conventionally considered. Furthermore, although offenses related to child abuse had been overlooked as disciplinary punishment by parents in the past, the Law clearly mentioned that a person who commits such an offense should not be immune from being punished on the ground that he/she is the person who exercises parental power. 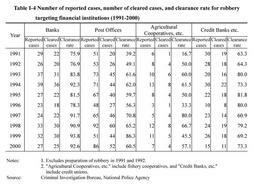 Table I-8 shows the trends in the number of reported cases, the number of cleared cases and clearance rates over the last decade for offenses with the misuse of credit cards, bank cards and consumer finance cards. On June 26, 2001, the Law for Partial Amendment of the Penal Code (Law No.97 of 2001) was enacted. The law is intended to additionally punish a person who has committed an act of illegally producing, using, assigning, lending or importing electromagnetic records that are to be used for the administrative dealings involving a person's property and that comprise such payment cards or an act of obtaining, providing, or storing information in electromagnetic records for the purpose of using them for illegal production of those cards. The law came into force in July 2001. The Law Concerning Punishment of Organized Crime and Control of Crime Proceeds and Other Matters (Law No.136 of 1999) was promulgated on August 18, 1999 and came into force in February 2000. The Law provides that the penalty shall be increased for specific penal code offenses such as homicide and arrest and confinement in the case where (i)the offense is committed as a group activity by the organization that intended to commit an act corresponding to the offense or (ii)the offense is committed for the purpose of obtaining illegal interests for the group. The Law also provides the regulations to punish such acts as disguising, concealing, or receiving crime proceeds related to these penal code offenses and other specific crimes or acts of changing corporate executives for the purpose of taking over the control of the business management of the corporation with the use of crime proceeds. The Law further provides for the regulations concerning confiscation of and collection of the corresponding value to be confiscated of crime proceeds and the maintenance procedures. The number of persons newly received by the Public Prosecutors Offices for violation of the Law in 2000 was 26, of which 23 were for opening gambling houses, etc. for gain in an organized way, 1 for conducting the business of a corporation using illegal proceeds, and 2 for concealing crime proceeds (according to the Annual Report of Statistics on Prosecution).